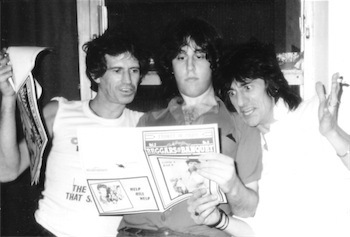 Bill German is the author of "Under Their Thumb: How A Nice Boy From Brooklyn Got Mixed Up With The Rolling Stones And Lived To Tell About It. The book recounts his misspent youth as a member of the Rolling Stones' inner circle. German's odyssey began when he was an aspiring journalist at the tender age of 16. He met the band on the streets of New York and was soon welcomed into their orbit as their official historian. For the next decade and a half, he traveled the world with them, stayed at their homes, sat in on their recording sessions, and witnessed their concerts from the wings. He was also present for their decadent parties and vicious in-fights. He survived by remaining a"fly on the wall" and by being the only sober person in the room. In addition to Under Their Thumb, German co-authored The Works with Stones guitarist Ron Wood. He has also written for Rolling Stone and Spin magazines, and has appeared on dozens of radio stations throughout the US and Canada as both a host and a guest. German majored in journalism & broadcasting at New York University -- until he dropped out to the follow the Stones. He resides in New York City, is 51 years old, and is currently on a lecture tour, offering his unique perspective on the "greatest rock 'n' roll band in the world."